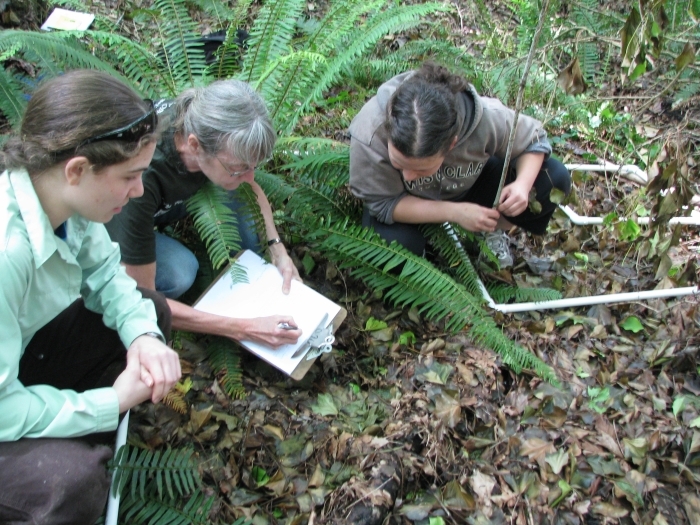 How does a forest's plant community respond after invasive plant species have been removed? In fall 2011, the city of Portland purchased 146 acres of forest adjacent to the Lewis & Clark College campus, creating the River View Natural Area (RVNA). At that time, RVNA was heavily invaded by non-native plants. The city removed these species by cutting/herbicide. This action created an opportunity to investigate forest recovery after invasive removal. Will native species return without further management? Or will removal of these species lead to new invasions by non-native plants? To answer these questions, we compared the abundance and diversity of both native and non-native plant species in 100 randomly-chosen plots in RVNA (“removal plots”) to that in 100 plots in adjacent control areas (“control plots”) where invasive plant species persist. In 2013, the second year of a long-term study, we found positive evidence of recovery. Invasive ivy was less abundant in the removal plots than in the controls; the size of this difference has increased since 2012. About 55% of removal plots contained native herbs, compared to only ~30% of control plots. The number of species of native herbs in removal plots significantly exceeded that in controls, and has increased significantly since 2012. However, in 2013, the proportion of removal plots containing non-native herbs other than ivy and clematis was greater than the proportion of control plots; the incidence of these species has increased since 2012. Curiously, some shrub species were more abundant in the control plots than in the removal plots. Continued monitoring will determine how relationships between native and non-native species will continue to shift over time.